Gripple End Fixings – Gripple delivers complete solutions for all types of building project. Our ready-to-use kits are supplied with a wide choice of pre-crimped end fixings, suitable for a variety of substrates. Take a look at our full range and contact our technical team to discuss the best option for you. Interested in more information on these products, email us. 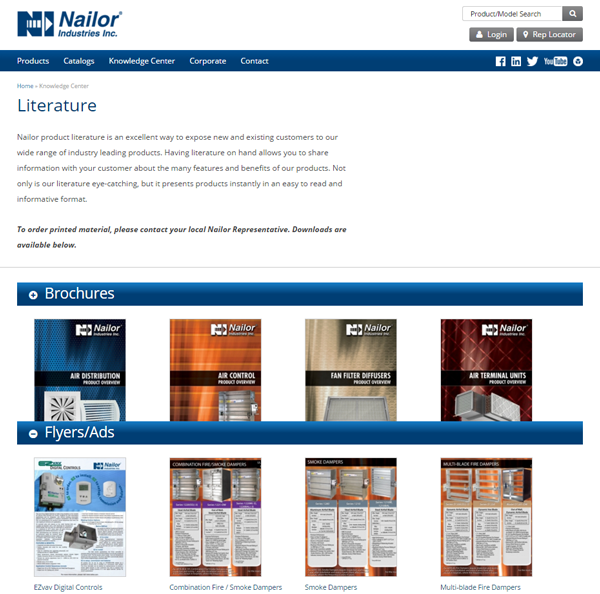 At Nailor, we thrive on customer satisfaction, offering our clients new products and solutions in order to provide a competitive advantage in the industry. We are now pleased to be able to offer architectural “Woodgrain finishes” on several steel and aluminum products as an alternative to conventional paint color finishes, allowing us the opportunity to integrate high-end, visually-appealing products into today’s built environment. 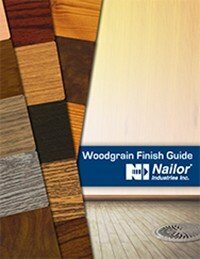 Woodgrain offers a cosmetically-appealing, environmentally-friendly solution for many Nailor Air Distribution products such as 39VH Series Vertical Hi-Rise Fan Coil Units, 41VX Series Exposed Cabinet Vertical Floor Fan Coil Units, Architectural UNI Plaque Ceiling Diffusers, 4900 Series Linear Bar Grilles, 5000 Series Slot Diffusers, Flowline, Displacement and UFAD Diffusers. 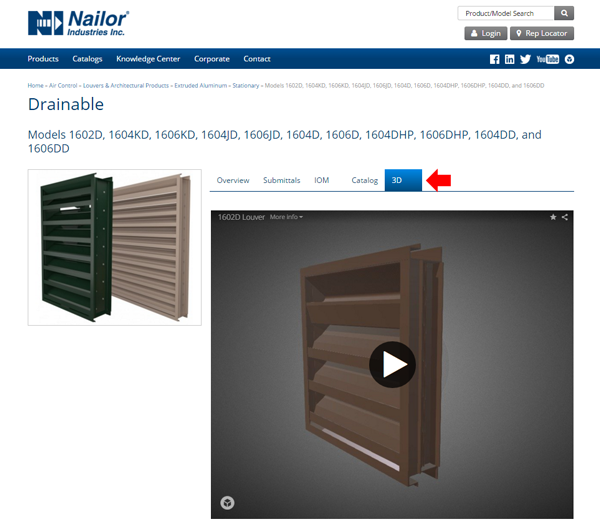 Using the latest technology, we are able to produce a high-resolution 3D rendering creating a virtual showcase of Nailor’s product offerings. This experience recreates the real-life movement and capabilities along with displaying high-fidelity texture and details. Please let us know If there is a product offering that you would like to see. Facility staffs have increasingly diverse needs affecting their choice of a BMS to their preference for specific protocols to use. IT departments play a more prevalent role in the decision making process since they are mandated to ensure any solution deployed meets strict cyber security requirements. Flexible integration architecture is a necessity when integrating room controls to front-end systems. To address the resulting complexity of these requirements, Phoenix Controls developed Vantage Room Manager. This software package meets customer’s varying needs while rounding out your Vantage system integration product portfolio. When deployed with Room Integrators or Room Controllers, Room Manager provides Vantage system-wide management features and a single IP network configuration that functionally replaces MacroServers. Functionally replaces MacroServer to support single IP integration requirements to BMS. Consolidates all Room Integrator (RMI) and Room Controller (RMC) databases into a single system database for integration to BMS. When integration is implemented directly from RMIs and RMCs (distributed integration requiring multiple IP addresses provided by the site), Room Manager can be deployed to provide management functions for the devices. Allows local station backups and restores for RMIs and RMCs. Room Manager is software only and can be installed on any computer or virtual machine that your end user prefers, as long as it meets the minimum specifications listed on the data sheet. For important information about availability, ordering, pricing, and licensing, read the full Sales Bulletin on the Partner website. Reasonable payback time and long-term savings had to justify changing the HVAC system in a construction project already underway. Cdi, the project’s mechanical engineers, showed that switching to a Phoenix Controls VAV design offered a tremendous opportunity for cost savings while providing the accuracy and repeatability required to maintain a safe and healthy environment. VAV energy efficiency also qualified for utility incentives that offset costs and reduced the payback period. Providence Everett facilities and CDi Engineers decided to use Phoenix Controls VAV tracking pair valves in each patient room. 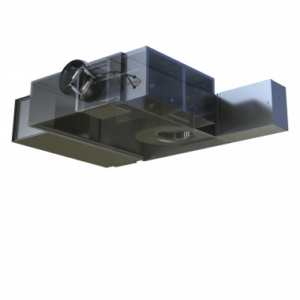 Phoenix Controls venturi valves’ accuracy and turndown capabilities enabled significant energy savings while providing the precision airflow control required in high consequence spaces. The tracking pair system also enabled easy transitioning to a pandemic ready facility if needed. For the full pdf case study please click here. As a founding member of the American College and University Presidents’ Climate Commitment, Arizona State University’s (ASU) president committed to becoming carbon neutral by 2025. The university launched a campus-wide carbon reduction initiative and identified buildings, for their large amount of energy consumption as an important part of their plan. One obvious area of focus for energy reduction was on research and laboratory facilities including the 350,000 sqft, LEED Platinum, Biodesign Institute. After evaluating several measures, ASU selected Aircuity. The solution was implemented through out the building and saved the university $1,000,000 annually. After the resounding success of the Biodesign Institute, ASU went on to install Aircuity in 24 buildings across campus to date. These spaces include additional science facilities, a student center, library, classroom buildings, and an arena. ASU is a great example of the wide range of buildings on a campus that can benefit from an airside program. Our customers have told us that implementing a program is a smart investment. Beyond the significant energy savings, an airside efficiency program also reduces the deferred maintenance backlog, validates M&V, reduce operations spend, enhances indoor environmental quality and delivers an information layer for continuous commissioning. Near net-zero energy usage is achievable for laboratory buildings only by employing a holistic approach that examines how all the available energy-saving technologies work together before focusing on a few, high-impact concepts. These concepts not only reduce energy costs by 50 percent or more, but also can significantly reduce upfront costs. Employed piecemeal, however, they can backfire. Take airflow, for example. Because airflow is the biggest driver of energy usage in labs, airflow reduction is the key to savings. Utilizing energy models is important, though, since low-flow design can lessen the effects of other energy-saving concepts, says Gordon Sharp, chairman and founder of Aircuity, Inc. Achieving net-zero energy for a laboratory building alone (where all necessary power is generated on the building itself) is difficult, adds Sharp, because the typical energy output from solar panel technology is only 10 to 20 kWh per sf, and the minimum energy consumption for most labs is 15 to 40 kWh per sf. But achieving net-zero for an entire site is possible by reducing the lab’s energy usage in conjunction with generating energy with photo-voltaics elsewhere on site. Energy and cost savings can be maximized in lab settings by focusing on a few targeted, high-impact concepts, says Sharp. Sharp’s company developed an energy analysis tool that holistically evaluates a lab’s needs and focuses on its unique requirements. The majority of a lab’s energy is used for heating/cooling outside air, so available tools that focused on building envelopes weren’t effective. Aircuity’s model calculates probable energy and upfront costs, taking into account the proposed design and outside climate, and how various energy-saving approaches would work within those parameters. “All these technologies interact, and if you look at each product separately, that doesn’t account for the interaction and often adds up to more cost than energy savings,” he says. The U.S. Department of Energy (DOE) has expressed interest in using this analysis tool, which has already been accepted by utility companies and others. “To optimize lab safety, first cost, and energy, combine systems based on analysis of net benefits,” he advises. Air changes per hour (ACH) ventilation dilution rates. Whichever factor is highest will dictate the lab airflow, says Sharp. Reductions in one area do not necessarily affect overall energy consumption. For example, to save on thermal energy, a lab can use more efficient freezers, but doing so could increase HVAC energy, because those freezers were generating heat and possibly reducing reheat costs. There are various means to reduce airflow from fume hoods, including high-performance devices such as low face velocity hoods and filter or ductless hoods. Encouraging good sash-closing habits helps, or use automatic sash-closing technology. For labs with a moderate to high density of hoods, new ANSI Z9.5 minimum fume hood airflow requirements promote significant energy savings, says Sharp. The new recommended range allows for as low as 100 cfm for a 6-foot hood when the sash is closed. For extremely high-density labs, such as six to eight hoods in 1,000 sf, keeping the sashes down and using low fume hood airflow minimums is probably the only way to reduce airflow, adds Sharp. Typical thermal loads for labs are 2.5 to 3 watts per sf, which would require less than four ACH during the day to cool the room, he adds. Reducing the ACH in a lab environment to two to four during the day and two at night is an achievable goal. If high thermal loads are the culprit, using chilled beams or hydronic cooling to decouple the airflow from the actual thermal loads is beneficial, he adds. Demand-based control is one of the best ways to lower ACH in the lab room. A system of centralized sensors monitors the indoor environment for contaminants about once every 15 minutes. If the air is clean, the airflow minimum is reduced to as low as two ACH; when air contaminants are sensed, the airflow is increased to eight to 16 ACH. Sharp’s company has done more than 500 projects with the demand-based control concept, and this approach is even referenced in the ASHRAE HVAC Applications handbook. Variable exhaust fan exit velocity control also can lower airflow. Typically, exhaust fans run at a constant flow with a high exit velocity, so exhaust air doesn’t flow back into the building or into other buildings nearby. A damper adds roof air to the exhaust when this airflow drops in order to maintain constant flow. 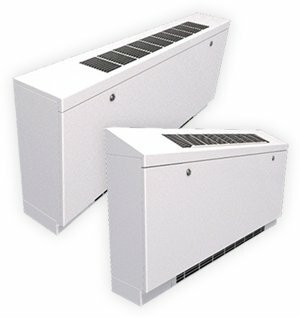 To save energy, one or more manifold fans can be staged, or sequentially turned off, as the building airflow is reduced. However, even staged exhaust fans can consume more than two times the energy of exhaust fans operating in variable air volume or VAV mode, says Sharp. When wind speed is low enough and coming from the right direction, the exhaust discharge velocity can be reduced without increasing its reentry into the building. 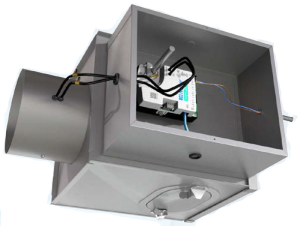 A wind responsive exhaust fan control system uses anemometers, controls, and a table determined by wind tunnel testing to reduce the exhaust fan airflow under certain wind speed and direction conditions. A demand-based approach that measures the contaminants in the exhaust air can save even more energy, says Sharp. 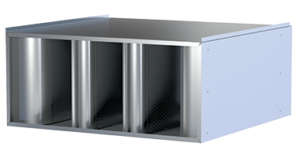 When the exhaust air is clean or has a low contaminant level, the airflow can be reduced while limiting reentry to safe levels. 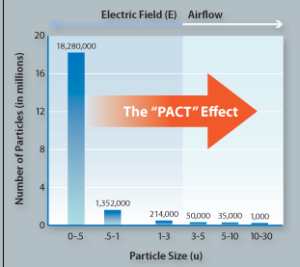 When contaminants are detected, the exhaust fan flow is increased. For most labs, the exhaust air is clean 98 percent of the time. Chilled beams are higher on the pyramid because, although they are a great energy-saving concept, they work most effectively when coupled with reduced airflow and demand-based control, says Sharp. Cooling requirements in most labs are low, so beams placed in a lab with six to eight ACH won’t get used often, because the necessary cooling comes from the airflow itself. 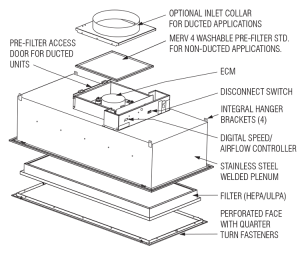 If a demand-based approach can be used to reduce outside airflow requirements for dilution ventilation, then chilled beams can decouple the outside air and supply airflow requirements. When the lab’s cooling requirements exceed the cooling provided by the two to four ACHs in demand-based control, then the chilled beams will take care of additional cooling requirements. This also enables a downsizing of the HVAC system, because its use is based on the ventilation requirements of the lab, which are going to be low most of the time, adds Sharp. The combination of chilled beams and demand-based control results in lower HVAC system upfront costs. These savings are usually higher than those realized from conventional VAV control or chilled beams alone, he notes. Heat recovery is at the top of the pyramid because for all but extremely cold or extremely hot and humid climates, it often provides less savings, says Sharp, especially compared with reducing airflow. An enthalpy wheel provides the most effective and efficient means to recover and transfer thermal-related energy and humidity-related energy. This large, porous wheel rotates through the exhaust airflow stream on one side and the fresh air stream on the other, swapping the airstreams and transferring moisture and temperature in the process. Since a small amount of contaminants carries over from the exhaust to the supply airstream, these wheels should be used only with airflows that are strictly room exhaust, with no fume hood exhaust. Runaround loops—two linked coils filled with a heat-conduction liquid such as glycol—can be used to safely transfer sensible energy or thermal energy only from the fume hood exhaust to the supply air. They can be effective in cold climates but don’t offer as much savings in more temperate or warm and humid climates, and in some cases can increase costs, says Sharp. “It is important to remember that these coils cause a significant pressure drop, and you have to pay for that pressure drop in energy. This energy cost reduces the total thermal savings, so the result in some cases can actually be a net increase in total energy used. Enthalpy wheels offer more payback in cold and dry climates or very humid environments, whereas runaround loop systems are best applied in colder environments, where there is more heat energy to be recovered. These energy-saving technologies and philosophies work well even in extreme climates, says Sharp. One example is the Masdar Institute of Science and Technology (MIST) in Abu Dhabi, where temperatures can get up to 120 degrees with high humidity. The project consisted of two buildings totaling 1.5 million sf, about 250,000 nsf of which is lab space. Their goal was to build sustainable but also economically viable facilities without spending millions. Using the energy analysis tool, Sharp looked at how much the energy costs would be for a smaller lab project of about 125,000 gsf, with 50,000 nsf of lab space and 30,000 nsf office space—about one-fifth of the total project. Factoring in a conservative minimum ACH baseline of six, local energy costs, a low to moderate density of hoods, and the Abu Dhabi climate, he concluded that baseline energy usage would be $600,000 for that portion, or $3 million total annually. 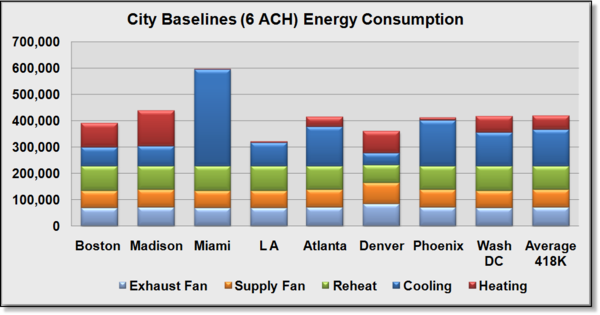 Cooling costs constituted 60 percent of the total energy use. The analysis showed that combining several high-impact approaches could achieve a 74 percent energy savings. Demand-based control reduced airflow to two ACH minimum day and night when the lab air was clean, and up to 14 ACH when contaminants were detected. Fume hoods were operated with automatic sash closers and airflow minimums at 100 cfm, or 150 hood ACH when the sash is closed. Chilled beams, some aspects of low pressure-drop design, and an enthalpy wheel were also employed, says Sharp. Demand-based control alone reduced lab HVAC energy costs by $322,000 annually, or 53 percent. The system paid for itself in 1.4 years, he adds. The HVAC system capacity also was reduced significantly for MIST, resulting in upfront cost savings. Even more importantly, the lower energy requirements reduced the size of the photo-voltaics needed to run the buildings and achieved a near net-zero result for the site. The demand-based control, even with the impact of the other energy savings approaches, saved about 9,000 megawatt hours for the whole project, or about four megawatts of solar capacity—roughly $20 million of first cost, according to Sharp. Low airflow lab design represents a paradigm shift, but the savings are so significant and easily achievable, it should be used as the foundation for efficiency, believes Sharp. Utilizing these savings measures also allows for more open and flexible lab designs, because you are creating an environment more akin to an office than a lab. And the low airflow designs can be adapted to work in any climate. This report is based on a presentation Sharp made at Tradeline’s 2014 International Conference on Research Facilities. would bring us back to carrying people in litters rather than using wheels. Certainly it would be simpler and more economical to build litters than automobiles and jets. The technology behind the controls sequence is not new. It is used on large equipment every day. Every day, we design buildings with air handlers that are designed to be used in VAV applications. This is for the purpose of saving energy and investment money by using smaller equipment to satisfy only the simultaneous building load rather than the total building peak load. This allows us to take advantage of building diversity and save money both in first cost and in operating costs. What is new is that the ECM motor gives us the opportunity to improve the old way. 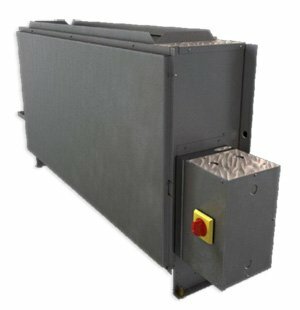 The old-style fan coil units using PSC motors cause the hotel to be conditioned with equipment sized for the total load; however, the room very rarely sees total load conditions. Having on/off control with 3-speed motors and 2-position valves does not allow the fan coils to address part load conditions. This new design allows for the room equipment (the fan coils) to address not only full load conditions, but also part load conditions where the room lives at least 85% of the year. The new design will meet the building design requirements under all operating conditions. and blower efficiency both increase as the motor rpm and airflow are decreased, the owner or user pays lower utility bills while the equipment provides a superior environment and lower sound levels. Forward looking companies should require that new technologies be used when available and when they can improve the building so that their clientele, the occupants, are able to take advantage of lower energy costs, improved IAQ and lower sound levels. ECM motors and dynamic fan and valve control designed to regulate discharge air temperature certainly meet that criteria. 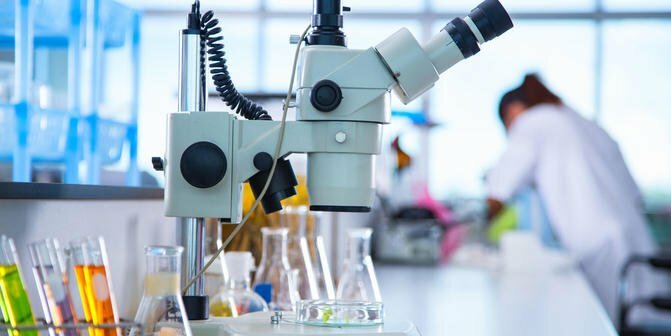 Energy demand and utility costs in laboratory buildings are very high — they can require 5-10 times more energy per square foot than a typical commercial office building. Given all the scientific equipment and technology found in modern research labs, this isn’t hard to imagine. Laboratories are so energy intensive for a number of reasons, spanning far beyond lab equipment, each with a variety of energy savings opportunities. We’re taking a look at a few of the reasons why labs require so much energy to operate and what is being done to advance laboratory energy efficiency. In many lab buildings, HVAC (heating, ventilation and air conditioning) systems make up the majority of the building’s energy demand. Because a safe research lab environment needs clean air, lab building ventilation rates are particularly high, sometimes up to 12 Air Changes per Hour (ACH). This means that in each hour, the entire volume of air in the lab is completely replenished with clean air 12 times. Depending on how sophisticated the HVAC controls are, as well as the occupant work schedule of the lab, facility managers can program the building’s HVAC system to operate at the minimum rate (four ACH) when the building is unoccupied, and raise it to the needed ventilation rate when the building is in use. 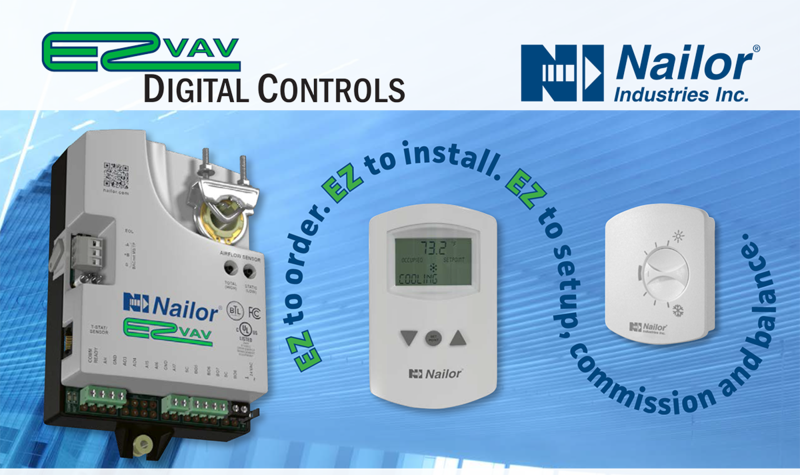 More advanced HVAC control systems can adjust ventilation rates based on indoor air quality using real-time, zone level data. This means that ventilation rates can increase when contaminants are detected in the air, and decrease when the indoor air quality is high. This can significantly reduce energy consumption while still maintaining a safe work environment at all times. When considering retrofit and retrocommissioning options in a lab building, financial decision makers should first start with HVAC systems for a cost effective energy efficiency upgrade. As another example of energy use in lab buildings, lab fume hoods can consume as much energy as two to three homes in the US. If you aren’t familiar with this widely used technology, a fume hood is a ventilation device that protects lab workers from breathing in volatile chemicals by drawing in air from the lab space and pushing the air outside the building. The number of fume hoods in a lab affects the utility costs of the building significantly. With fairly simple behavioral changes, like using a sash (a moveable shield at the opening of the fume hood) when the fume hood is not in use, energy can be saved in two ways. First, less conditioned air is pumped out of the room, reducing the demand on the lab’s HVAC. Second, with Variable Air Volume (VAV) fume hoods, shutting the sash will reduce the rate of exhaust air flow to maintain the minimum ventilation rate. This reduces energy consumption, as well as upholds a safer work environment for occupants. As a result, it would be wise for labs to adopt this practice as policy, as well as engage lab workers to shut the sash when the fume hood is not in use. The Alliance to Save Energy’s PowerSave Campus program has implemented several fume hood energy competitions resulting in huge energy savings. Currently, a “shut the sash” competition is being held at UC San Francisco, where after just one month of outreach to around 40 lab employees using 22 fume hoods, annual savings are projected to reach approximately 148,000 kWh and $19,000. To help ensure long term energy saving practices continue, frequent reminders through visual cues and other outreach techniques will be implemented after the competition is over. According to Allison Paradise, executive director of My Green Lab, one of the most important energy saving strategies that is often overlooked is occupant behavior change, especially in labs that have already implemented energy efficiency measures. In addition to shutting the sash on fume hoods, a few easy strategies that can reduce the operational costs of a lab include: turning off the lights at the end of the day, utilizing task lighting, unplugging lab equipment and using appliance timers. Switching an Ultra-Low Temperature Freezer used to store samples from -80 degrees Celsius to -70 degrees Celsius can potentially reduce the freezer’s energy consumption by 30 percent. This can save the lab a substantial amount of money and can be done without the risk of damaging most samples. Even with an abundance of energy savings opportunities, promoting behavior change in research labs can be challenging. In an atmosphere where scientific research always takes priority, saving energy is not something most lab workers often think about. Moreover, if behavior change means altering something that could, in some conceivable way, negatively affect research, it often ends the discussion prematurely. That’s why it’s up to building facilities managers, EH&S, energy efficiency professionals and energy conscious building occupants to communicate how energy efficient behavior practices can be done safely and with minimal effort. Ideal for use in hospitality, condominiums and an excellent retrofit choice; the 41V Series will initially be available in concealed and exposed chassis. The exposed chassis will offer both a traditional and sloped top arrangement. Assortment of fasteners, including 1/4 turn or tamper-proof available. Metropolitan Equipment Group, Inc has recently updated our stock catalog. 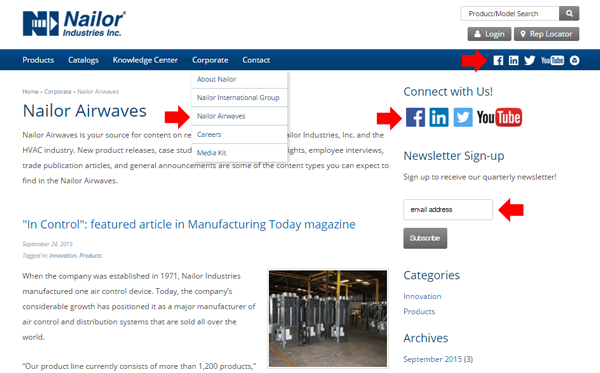 Please click below to download the latest version, or check out our warehouse section for additional information. Welcome to the University of Maryland, the location of the 2015 Big Ten & Friends Mechanical & Energy Conference. This year’s conference will be held September 20 – 23, 2015 at the College Park Marriott Hotel & Conference Center and we look forward to your participation. The Big Ten & Friends Mechanical & Energy Conference will bring together facility owners, operators, engineers and professionals in higher education and business partners to network, listen to, and take back information to continually improve the sustainability and efficiency of campus and university infrastructure. Mechanical infrastructure and operation directly impact facilities’ energy and carbon footprint. This year’s conference hopes to blend industry developments and practices to improve energy consumption, ultimately and potentially reducing carbon footprint while meeting ever-increasing demands for resiliency, reliability, comfort, and indoor air quality. Methods of monitoring, measurement, and control allow for facilities personnel to meet these needs. The University of Maryland is located just outside the Nation’s Capital, Washington, DC. The College Park Marriott Hotel & Conference Center, located within the 1856 Land Grant Institution, is within walking distance of the University grounds and facilities. We truly hope you will be able to join us for both an enjoyable & educational experience. up to 12 Air Changes per Hour (ACH). This means that in each hour, the entire volume of air in the lab is completely replenished with clean air 12 times. Depending on how sophisticated the HVAC controls are, as well as the occupant work schedule of the lab, facility managers can program the building’s HVAC system to operate at the minimum rate (four ACH) when the building is unoccupied, and raise it to the needed ventilation rate when the building is in use. More advanced HVAC control systems can adjust ventilation rates based on indoor air quality using real-time, zone level data. This means that ventilation rates can increase when contaminants are detected in the air, and decrease when the indoor air quality is high. This can significantly reduce energy consumption while still maintaining a safe work environment at all times. When considering retrofit and retrocommissioning options in a lab building, financial decision makers should first start with HVAC systems for a cost effective energy efficiency upgrade. Recommission or Retro-Commission (RCx) – No news, doesn’t mean good news! times we simply respond to complaints and when there aren’t any, we assume the system is working properly. Based on our extensive experience in engineering, servicing, commissioning and re-commissioning labs, we know that serious operational problems affecting airflow, safety and energy efficiency can be present even though occupants are not complaining. Whether your laboratory is relatively new or decades old, a periodic review of your airflow control systems is essential to maintaining the energy savings and safety of the system. Metropolitan Equipment Group will take the time to understand your needs and develop a plan with the entire team to recommission the system to realize the energy savings potential and bring safety back to the forefront. As laboratory buildings grow more complex and more highly tailored, the controls necessary to protect the health and safety of the occupants also become increasingly complicated. This is particularly true in an academic setting where labs are highly customized. Recommissioning (RCx) has become an increasingly common process for laboratory air flow systems. While recognizing the increased complexity and interdependency of systems, at the end of the day, the relationship between the laboratory controls and the building automation system is what helps to maintain containment and user safety within these laboratories. Even if your laboratory was commissioned when it was originally built (many were not), it has likely changed over time to meet changing needs. The addition or removal of fume hoods, snorkels, walls or partitions will change the airflow requirements of a laboratory. Additionally, if equipment is overridden or disabled by occupants (not uncommon) or by component failure, laboratory performance will be affected, even if things seem to be working properly. fume hood re-certification isn’t enough. Though fume hood re-certification is important, it doesn’t provide the complete inspection, testing and verification of your laboratory airflow control system and comprehensive documentation of results and recommendations that RCx does. It also doesn’t identify energy saving opportunities that, when implemented, typically save our clients 15-20% a year in energy costs. Our team is geared to enhance safety and comfort while achieving energy savings. Labs that are properly recommissioned will offer comfortable, safe environments that increases productivity while eliminating smells and sounds that threaten occupant safety and productivity. Did you know HVAC costs in commercial buildings represent 1/3 of the total energy use? Aircuity CO2+ is an exciting new addition to the market place as it delivers reliable CO2 demand control ventilation (DCV) to reduce energy use, enhance the indoor environmental quality (IEQ) for occupants and provide insightful data on building ventilation performance. The majority of building ventilation systems run at constant levels, regardless of the actual occupancy at any given time. Vacant conference rooms, offices or classrooms are typically overventilated, but when these spaces are fully occupied they quickly become underventilated, leading to uncomfortable, unhappy occupants and lower productivity. Adjusting ventilation rates to match these changing conditions allows for energy savings and a better IEQ. Aircuity is the most reliable method of DCV, specifically designed to overcome the deficiencies of discrete sensing systems. 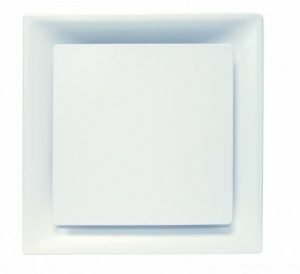 Discrete sensors become inaccurate over time, typically reporting CO2 levels higher than actual conditions, which will cause the building to become overventilated again, eliminating energy savings. Trying to calibrate and replace a large number of discrete sensors on a regular basis is difficult and results in higher life cycle costs. 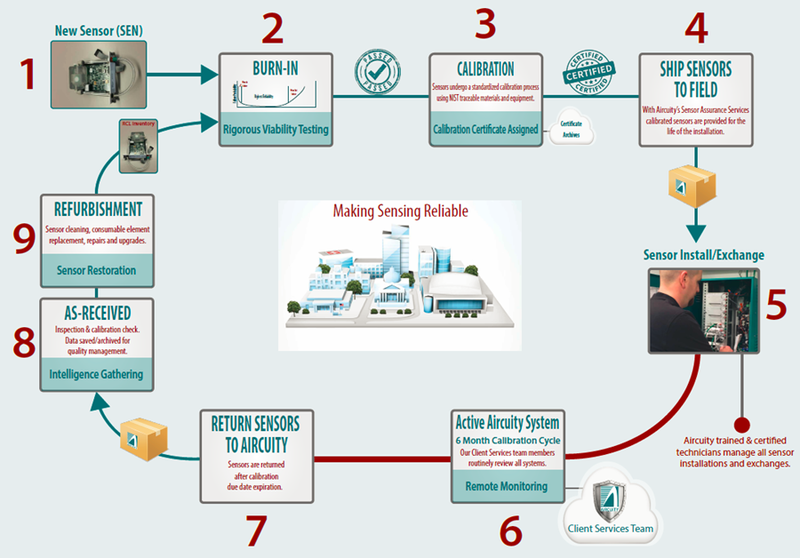 Aircuity’s remote sampling, centralized sensing architecture significantly reduces the number of sensors and utilizes a unique differential measurement approach to ensure accurate and reliable measurements of IEQ parameters for superior DCV. Aircuity takes air samples from variable occupancy spaces throughout a building and routes these back to a centralized sensing suite (SST). 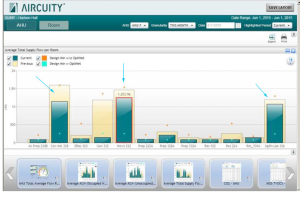 With just a few sensors centrally located, Aircuity is able to provide a maintenance program that assures proper system functionality by replacing sensors every six months with factory calibrated sensors. 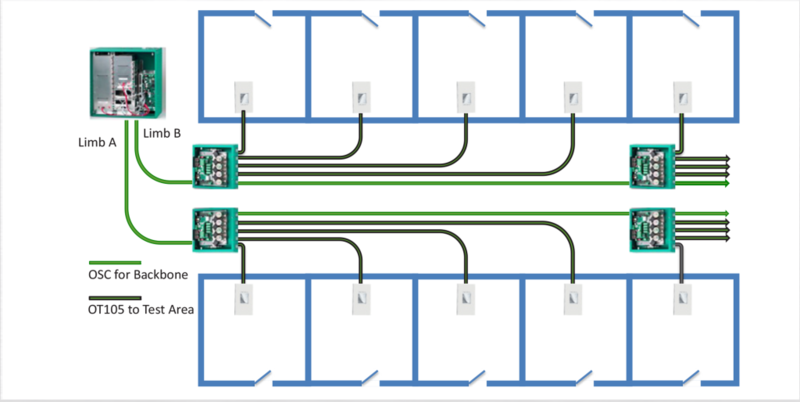 In addition to offering reliable DCV, the newly designed system architecture allows for a cost-effective approach. The new SST550 utilizes Alternating Limb™ functionality, which significantly increases the number of areas sampled, when systems are configured in a “balanced” manner as shown below. When considering life cycle costs such as annual calibration, sensor replacement and estimated 5 year operating and maintenance costs, Aircuity’s CO2 DCV solution costs significantly less (see table). This new product makes it possible for customers to have it all—and makes Aircuity CO2+ the right choice for nearly any CO2 monitoring project. How much less is Aircuity compared to discrete sensing? Baptist Health Lexington (known for many years as Central Baptist Hospital), is a 383 bed tertiary care facility located in Lexington, Kentucky. Established in 1954, Baptist Health is renowned for its regional leading cancer care as well as its Heart Institute. Since the first baby was delivered there 2 hours after the hospital opened in 1954, Baptist Health has been known as the “baby” hospital in Central Kentucky, delivering over 4000 babies annually. In the mid-2000’s, Baptist Health built an 8-story addition to the hospital to house their new Heart Institute as well as outpatient services and medical offices. Before the addition to the building (which raised the existing structure from 3 stories to 8 stories), grease exhausted from the existing cafeteria was simply exhausted above the 3-story structure. Now, with the five additional stories, this same exhaust was being carried by prevailing winds into the new taller structure causing odor issues as well as potential sanitary issues in the new addition as fresh air intakes were built into the façade of the new building facing the kitchen exhaust. 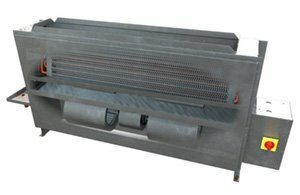 • Independently tested and certified to meet UL 762 Standard for Power Roof Ventilators for Restaurant Exhaust Appliances. • Designed to meet NFPA 96 Standard for Ventilation Control and Fire Protection of Commercial Cooking Operations. Thanks to the installation of the Strobic Air Tri-Stack® fans, Baptist Health has cured their kitchen grease exhaust issue. Due to the Tri-Stack’s® ability to provide very high dilution rates, typically 300-400% for restaurant applications, combined with its ability to create and maintain virtual plume heights of 30-50 feet without tall stacks and guy wires, the grease from the hospital’s kitchen exhaust is no longer detected by the patients and staff in the new addition, nor is grease building up on the windows or façade of the new structure. For more information on Strobic Air’s Tri-Stack Fans, please click here.